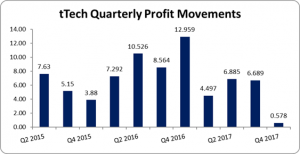 tTech reports 53% decline in twelve months net profit, for the year ended December 31, 2017, booked a 3% decline in revenues to $217.25 million compared to $223.16 million for the prior financial year. Cost of sales fell 14% to $28.08 million from the $32.75 million reported in December 2016. As such gross profit from declined 1% for the year to $189.17 million (2016: $190.42 million). Other Income, gains and losses year over year posted a loss of $439,000 relative to a gain of $9.29 million in 2016, while administrative expenses rose 5% year over year to $149.87 million (2016: $143 million). Other operating expenses for the year reflected a 9% growth year over year to $20.20 million compared to $18.48 million recorded in 2016. Consequently, Profit before Taxation decreased by 51% from $38.22 million in 2016 to $18.65 million. No Taxes were recorded for the period, thus Net Profit for the year amounted to $18.65 million versus $38.22 million booked in 2016. The earnings per share (EPS) for the year amounted to $0.18 compared to $0.37 reported in 2016. The number of shares used in our calculations is 106,000,000 units. The company’s stock price closed the trading period on February 26, 2018 at $5.00. As at December 31, 2017, the Company reported total assets of $208.77 million, a 6% increase when compared to $196.05 million in 2016. This was as a result of an increase in investments which amounted to $26 million (2016: $2.03 million). Shareholders’ Equity as at December 31, 2017 was $178.38 million compared to $163.97 million for the comparable period of 2016. This resulted in a book value per share of $1.68 compared to $1.55 the prior year.